I’d be interested to know how the French view Canadians…and if they can they tell the difference between Canadians and Americans? First of all, click on the link to get a little reminder about what the French think of Qu�b�cois (that’s “French Canadian” in English, even though they’re not French, they just speak the language). Now concerning “English-speaking Canadians” or Canadians as they’re called in English, it’s going to be an easy answer really. The French think that Canadians are Americans with less guns and more ice hockey, and if there are no guns nor ice hockey involved, they can’t tell the difference between both. The good thing is that there are no jokes about Canadians in France. The bad thing, is that you don’t really “count” in the eyes of the French. I guess I don’t have much more to add (I’m sure some commenters will). Oh and they have the Mountie too, I almost forgot about the Mountie. Previous Post What is your opinion on the “Intellectuels” in France? Next Post I can speak French but I can’t understand it. What should I do? I think (we) the French make a difference between �English-speaking Canadians� and �French-speaking Canadians�. The first ones are seen like Americans, with the same origins, culture, way of life etc. Whereas the second ones are seen like French with an american way of life but with the same cultural and political opposition towards Americans. Thanks Alain for your comment and helping me answering the question. Just find this blog.It’s nice. Canadians are seen in France as more peaceful thant Americans. We also have the feeling that they are a more thoughtful people. We also tinik that Canadians care less about money and goods than americans, it’s also true about religion. And you are absolutely right, it’s well known in France that guys from Quebec don’t like to be called Canadian. And it’s also true that by the way that QC is a french spoken state, we feel closer from them than English-speaking canadians. Sorry I have to correct you so I apologize in advance if I am coming off as rude however its a learning opportunity. Canada does not have states we have like in France Provence’s. Matthew, sorry I have to correct you so I apologize in advance if I am coming off as rude however it’s a learning opportunity. France has only one Provence and Canada doesn’t have any. Actually, there is only one Provence in the world. However, Canada does have Provinces and France has D�partements and R�gions. Oh dear! Do they really think we are as right-wing and religious as Americans? No, please no…. Ahem, the last time I checked, French-speaking Canadians were “Canadians” too. The term actually applied to them first, in fact. The Anglos joined in the party afterwards. The trick is that the French don’t realize how screwed up American religion and politics is. Their hear the news, but most of them don’t really comprehend the context, the background and those things. 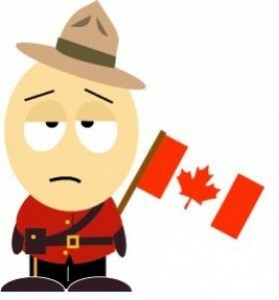 Many (most) Quebeckers consider themselves to be Qu�b�cois first and Canadian second, certainly, but as for outright rejecting one’s Canadian identity I think that’s fairly rare. There are plenty of francophone federalists out there (the ones who want to stay in Canada). They are not as noisy as the separatists (in terms of control of the media, the unions, the political discourse etc.) but they may possibly be in the majority by now. The French from France when naturalised shall be called FrancoCanadiens. Be aware that in the United States a naturalised American does not enjoy the same rights as a native born American. I’m American and I can add that Americans consider Qu�b�cois to be Canadians who speak just happen to speak French. I’ve been to Quebec and I understand this is not how they see themselves. And I’ve never heard any American use the term Francophone ever. I am American and I use the term francophone all the time. I also understand that the Qu�b�cois view themselves as very separate from the rest of Canada. Now, of course, I also lived and studied in Montr�al so of course I have an advantage in understanding the culture. But, Americans are not all as uninformed as you imagine. Please remember that the United States is a large country, geographically, and population-wise. Despite cable TV and the internet, there are still regional differences, although the differences are not as great as they used to be. Most people from outside the United States do not realize this, and I would venture to say that many Americans don’t even think about this. People in the northeastern United States tend to be more aware of Qu�bec issues. And, in my experience growing up in Maine, people in the northern New England region often feel culturally closer to areas of Canada than they do to, say, California. I think it’s also important to remember that our government is not the same as our people! Sure, some people are aggressive and carry guns, but for the most part, American PEOPLE are not militaristic, in thought, speech, or action. Though some people are “in your face” patriotic ( especially when America is at war), the vast majority of people are silent on the matter, but that goes unnoticed. The main difference I noticed when attending university with Canadians was that they were more passive in class discussions. Americans are taught that debate is a GOOD thing. We are taught that you should not take at face value everything someone else says – question it, look for a factual basis. Our schools instill this kind of “critical and analytical thinking” in students. But in Canada, even at the top university, this kind of behavior was looked upon with shock, as though it were rude. From my perspective, this is a thoughtful way of approaching academics… it’s not about being aggressive, it’s about thinking and analyzing. But from what I experienced, Canadians found it to be aggressive. Your thing about American students being taught to debate is also regional. A lot of Americans are very authoritarian. In school I noticed a lot of people are passive/submissive with authority (like teachers) but very aggressive with peers (which goes beyond being able to debate). We usually see Qubecers (or french canadians) as somehow intermediary between our french culture and north American Anglo-Saxon culture. We usually feel closer to them because we speak the same language and communicate easily. We have a lot of commun cultural references, despite many strong differences. They are seem as some sort of cousins that have the same cultural roots as us, but who live in a compeltly different world. very similar and very different at once. As for English-speaking Canadians, well, we don’t make a big difference with Americans. We don’t notice any differences in dress, accents, behaviours or looks. Well we see English Canadians as Anglo-Americans. English Canada is seen as culturally very close to the US, but with a more peacefull image (without the violent image often associated with the USA, and without the political association with some negative former presidents). This is a little pedantic, but “Quebecois” is “Quebecer” in English. “French Canadian” includes natives of the various (and, admittedly, generally small) Francophone communities scattered throughout the country. Well, I want to say it’s all a question of perspective and of what English you use. While I learned the term “Quebecker” (that spelling) in college in France, my Canadian civilization teacher there used the term “Qu�b�cois” even when speaking English (and if I remember correctly she was a Francophone Canadian from British Columbia). Once in the US, I started using both terms, but nobody understood me and I quickly found out that in US English, people living in Quebec and speaking French are called “French Canadians” and I don’t think there’s a term for Francophone Canadians out of Quebec, maybe they’re also bundled up as “French Canadian”. I think I can add that if Americans say “French Canadian” (or “French-Canadian”) that’s because it’s the old term that we used to use here too, before the 1960s. I’ll guess that the only distinction between Quebecker and Qu�b�cois is that when used in English the second refers to francophones whereas the first includes everyone…but that’s probably open to discussion! Oh but don’t read the comments on that blog – they get horribly nasty. Just read the posts!! Most French I’ve met are interested in visiting or living in Canada or the US but have more of a preference for Canada – maybe because of the language. They have exposure to more American media but the talk shows on French TV have more Canadian personalities than American…..and my French husband always laughs when he hears a French-Canadian speak French. It seems that the French think the Canadians are “cute” and the Americans “cool”.